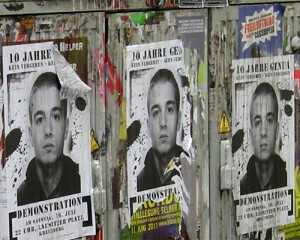 On this day in history, Frantz Fanon was born and Italian anarchist Carlo Giuliani was shot and killed by Italian military police during a protest in 2001. Today in 1881, Sitting Bull, after leading his people into Canadian exile, surrendered as his people lay starving. Here in Baltimore in 1887, it the midst of the Great Strike, the Maryland state militia opened fire on striking railroad workers, killing 50 strikers. Today in 1932, World War I veterans camped out by the thousands in Washington DC to demand benefits. Known as the Bonus Expeditionary force, they tried to march on the White House. Troops led by then-Col. Douglass MacArthur fired tear gas into the crowd and beat the Bonus Marchers. On this day in 2001, an estimated 200,000 protesters gathered in Genoa, Italy to protest globalization and capitalism at the G8 Summit. There was intense street fighting between protestors and Italian police. During one confrontation, a military police officer shot 23-year-old anarchist Carlo Giuliani, then ran him over twice with a Land Rover, killing him. On this day, we remember Carlo Giuliani. And it was today that the Romans under Titus destroyed the The Second Temple in Jerusalem, in what was the end of the 1st Roman-Jewish War. The great Jewish philosopher Josephus tried to be a mediary between the Romans and the Zealots. The First Temple was destroyed in 586 BCE when the Jews were sent into Babylonian exile, where many believe the story of Exodus came from. The Zealots were not part of the ruling Jewish communities, but the poor, and many were not the religious. They initially were winning, but were defeated; over 1 million Jews were killed and most of the rest went into exile throughout North and East Africa and Arabia. And the Congress of Confederate States convened for the first time in Richmond today in 1861, declaring their secession and independence from the United States. Among the first clauses of their Independence was their right to maintain slavery. Today in 1967, a year after Stokely Carmichael, later Kwame Ture, gave his Black Power speech in Berkeley, California, the First National Conference of Black Power convened in New Jersey, chaired by Nathan Wright with Rap Brown, Stokely Carmichael, James Farmer, Ossie Davis, Ron Karenga and over 1000 delegates from the US, Nigeria and Trinidad created a Black Power Manifesto that condemned neo-colonialist control of the Black population and created a philosophy of Blackness. The man who wrote Wretched of the Earth and Black Skin White Masks, who developed the psychiatric methods in the African world, and a philosophy of revolution based on Africa and the Diaspora, was born today in 1925 on the island of Martinique … Frantz Fanon. Helen Thomas passed away today in 2013. She was the first woman in the White House Correspondents Association and the National Press Club, who covered the 11th US Presidency. She was pointed, feisty, fearless and intelligent .. a role model for all women and all journalists. And the man known as one of the founding fathers of African Studies was born today in 1874, William Henry Ferris. He graduated from Harvard in 1900, wrote books like African Abroad and his Evolution in Western Civilization. He worked with Williams Monroe Trotter, WEB DuBois and the Niagara Movement and Marcus Garvey ..